Entering nearly 100 years of history into a modern content management system sparked new life into old stories. THOR had the pleasure of working with one of the true giants of the rail industry: LTK. They have been at the forefront of railroad engineering for nearly a century. Their expertise has guided some of the largest projects in the modern railroad era. When it came time to update their website, they turned to THOR to put a modern and intuitive spin on their vast trove of content. Our standard discovery process results in a written report filled with critical findings and guidance. Anyone that says they can build a website without first doing their homework is just blowing smoke. Design and development are fed by the knowledge of where you’re going and how you’re going to get there. THOR conducted a thorough discovery process through interviews and usability tests with LTK staff, clients, and peers. 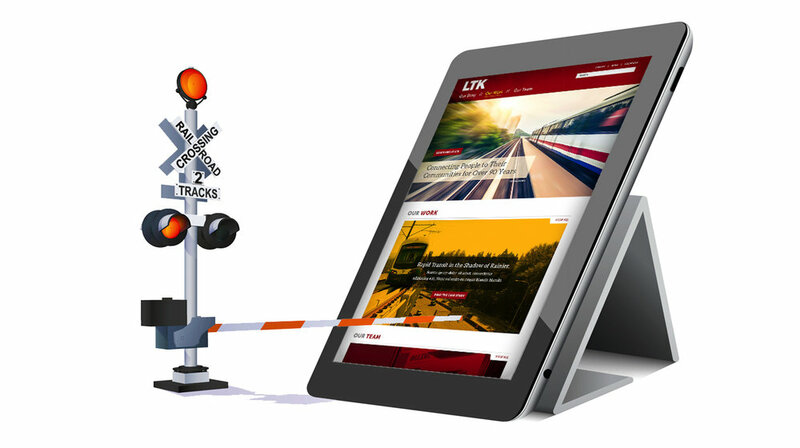 We found tremendous satisfaction within the rail industry with LTK as an organization, but their website gave the impression that they were behind the times. The results gave us a clear direction for organizing content within the site and implementing a design that was informed by hard data. We provided the findings in a digital format and presented them to the board of directors to create consensus in our goals and recommendations before proceeding to the architecture and design phase. Building on the Discovery findings, we positioned LTK’s field offices prominently throughout their work and developed taxonomies that highlighted their breadth of skills. There was a strong desire from LTK to tie the brand to a rich legacy of successful projects, so we built a comprehensive ‘Our Story’ section that forms a narrative from their history. Each landing page we created for the project spoke directly to a constituency LTK wanted to address but had been missing with their older site. The site’s design and development took place over a period of six months, with iterative examples of the site deployed to LTK on a monthly basis for review. THOR built the site using WordPress, utilizing custom page templates and a reliable base theme that gives the site a modular structure that can be easily expanded upon and modified as the organization’s objectives evolve. We document all of the architectural decisions that lead up to the design and development phase. Great ideas die in group projects when they aren’t communicated well. We pride ourselves on presentations, documentation, and project management that keep ideas among the living. Our process leaves little open to interpretation. We provide high-quality reports and guides throughout the course of design and development to assist our clients in giving us the best input possible. For LTK, the result of all the planning and preparation was a bold and vibrant site with content and structure to match the needs of the organization and its customers.